I admit, I didn’t even know Foundation existed until I bought it. It was bookahnerk who told me about it, showed it to me and suggested that I’d take a good look at the game because it could be something I’d really like to have. He was right, of course. He knows me too well. 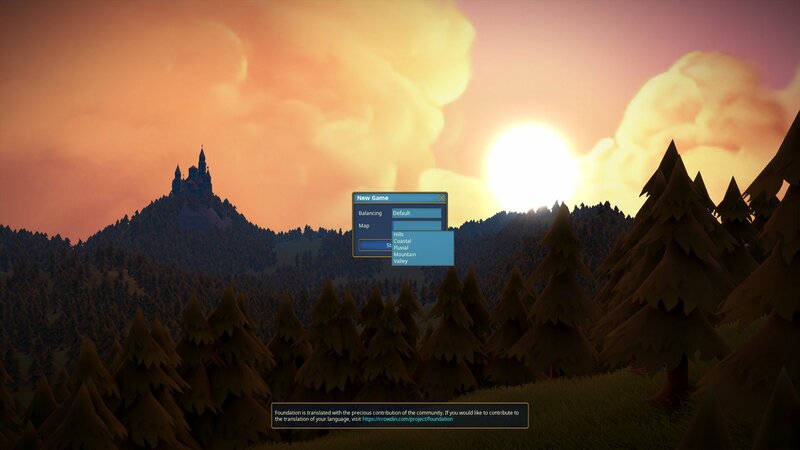 But, before anybody who reads this throws their money at their screen to buy the game, a word of caution: Foundation is in Early Access on Steam. The game is in development and thus, not yet finished, so be careful when making a decision of whether you want to buy it now or wait. There is no guarantee that the developers will finish what they started! As of right now, I’ve seen frequent bug fix patches and the developers seem active, but I still like to give this warning in general, because not everybody knows what Early Access means. 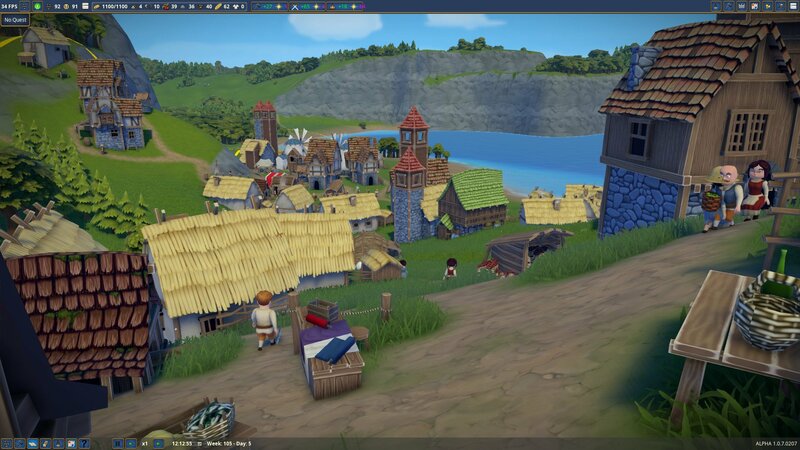 Foundation is essentially “yet another” city-building game. If I had to compare it to one of these other city-builders, I would go with the Cultures series. And if you search this blog for “Cultures”, you will find that I have made this same comparison once before: With Folk Tale. Folk Tale, by the way, is an excellent example for why one should be cautious with Early Access games. It is no longer sold and the developer has basically just abandoned the game and disappeared. But thankfully, we have a lot of other comparable games to choose from. The reason I am making the comparison with Cultures – in both cases – is the micromanagement. 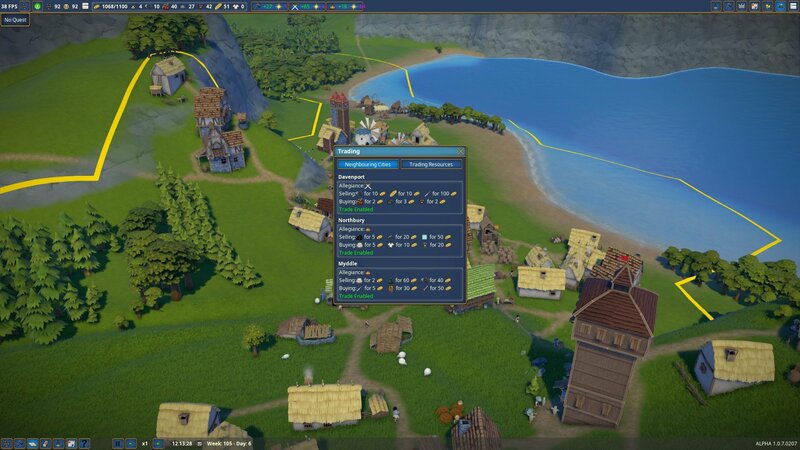 You can select individual villagers and choose their profession and their workplace. In German, these games are often said to have the “Wuselfaktor” (“woozle” would be how you’d roughly pronounce it; when translated something like “hustle and bustle factor”). 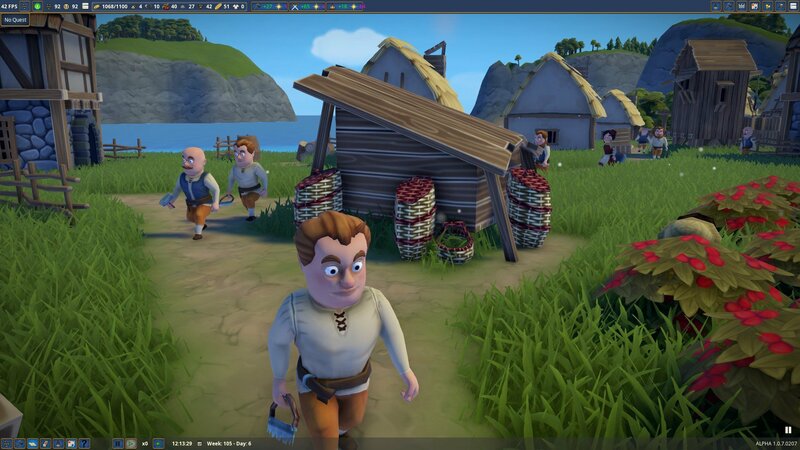 If you can make choices about the individual villagers, it is even more fun than just seeing them move in and go about their usual day without you being able to influence anything. The developers of Foundation summarize it with “ant-farm simulation” on their website. I guess that’s a valid comparison as well. So, let me tell you about my experience playing the game so far! My first game only lasted a couple of minutes because there was a bug with trading that didn’t let me proceed on the map I had chosen. A different map didn’t have that bug, so I restarted there. Only half an hour later or so, there was a bug fix for said issue. I haven’t tried it again on the other map, so I cannot verify it works now, but I would assume it does. I liked my second game, though, so I stayed on that map. Having said that, you start the game by choosing the kind of map you want to play on: Hills, coastal, fluvial, mountain or valley. I am currently playing on the coastal map. When you start a map, you get to choose where to put down the village center. You choose a starting hex on the map that way. This is represented by a couple of barrels if I remember correctly. So it’d be a good idea not to forget where you put it once you have more buildings on that tile. Sometimes, there’s a message popping up that an envoy wants an audience – this is one NPC near this center asking for you to send soldiers away to help them. You can do so and will receive some items, gold and a free zone expansion in return. But let’s not get ahead. For now, you’ve got nothing but the one tile and a village center. A few possible buildings are unlocked already, more will be unlocked later. You do not actually place down houses for your villagers. 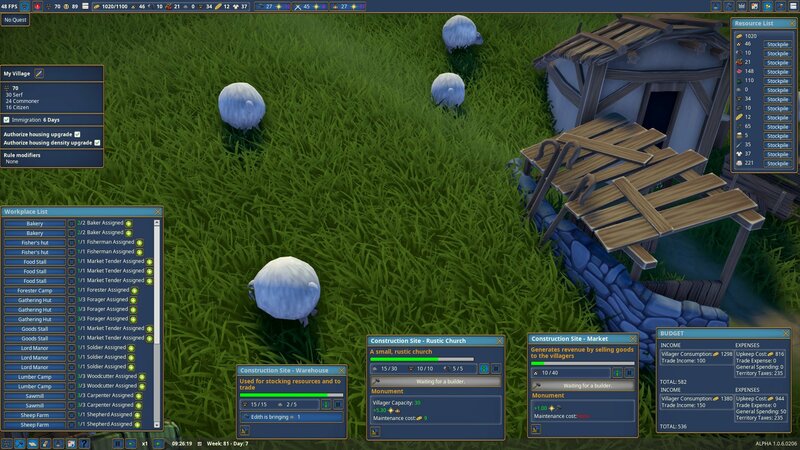 Instead, you mark areas where your villagers are allowed to build houses and they will do so as they see fit and need. You also do not need to worry about buildings roads. The villagers trample their paths down automatically. All other buildings are chosen by you. Make sure you have some builders and they will gather the resources and construct the buildings for you. 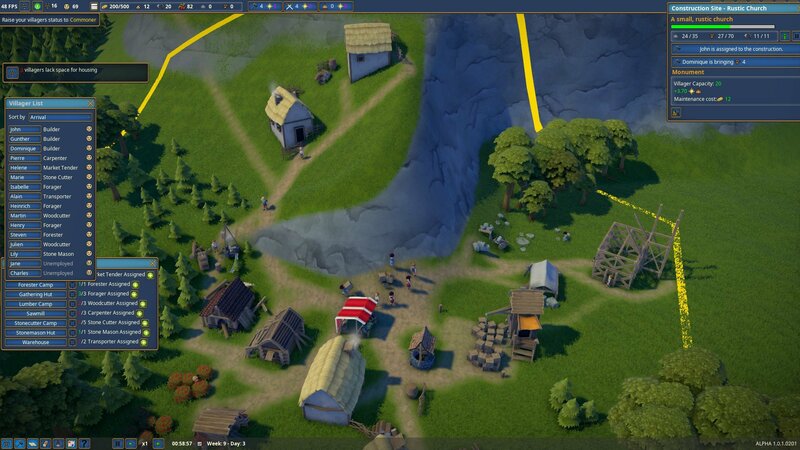 You also mark areas where the villagers can and should extract resources like stone, berries or trees to cut down. Likewise, you can also mark areas where the forester replants trees. You will get free zone expansions fast enough, so do not waste gold on them. Do not expand too fast either, even with free expansions. Always keep an eye on your budget! Your villagers also have needs. The higher in social status they are, the more they want. So far, fulfilling their needs adequately enough hasn’t been an issue for me. I’ve seen somebody on a Twitch stream where the villagers fled because they lacked food or housing. So you should keep an eye on it. I have several gathering huts with gatherers that collect berries, I have two fishers and three bakeries (complete with wheat farms, mills and wells, of course!). Now I don’t know anything about the proper balance of food production to amount of villagers. I only know that none of my villagers are starving and that my currency is usually at cap. Speaking of currency: At the beginning, you can only have a maximum of 500 gold. Anything earned on top will be wasted. 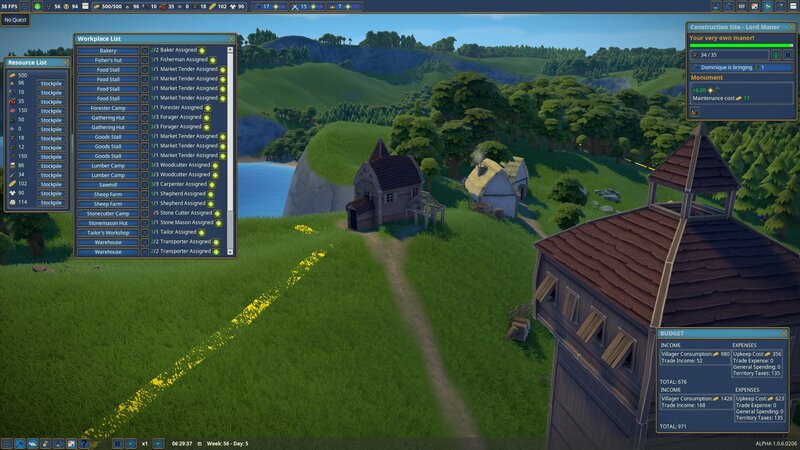 You can expand that cap by building a manor. There are a few quests guiding you through the game, but it’s more like a tutorial telling you what to focus on next than any real gameplay. 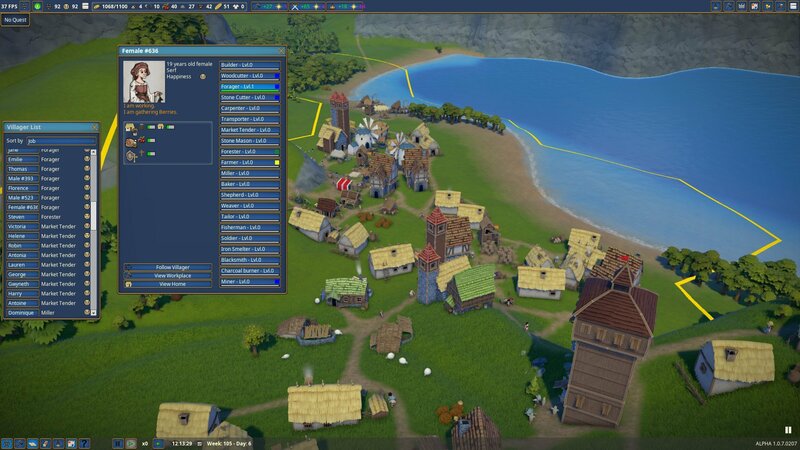 The last quest so far was asking me to build a church (a proper big one, not the little rustic churches I already have). After the church, I also unlocked the monastery which my villagers are now busy to build. I am lacking the resources I need for it, so I’ll have to buy them through trade – or expand further, so I can invite more villagers to come to my village in order to fill the vacant job positions. 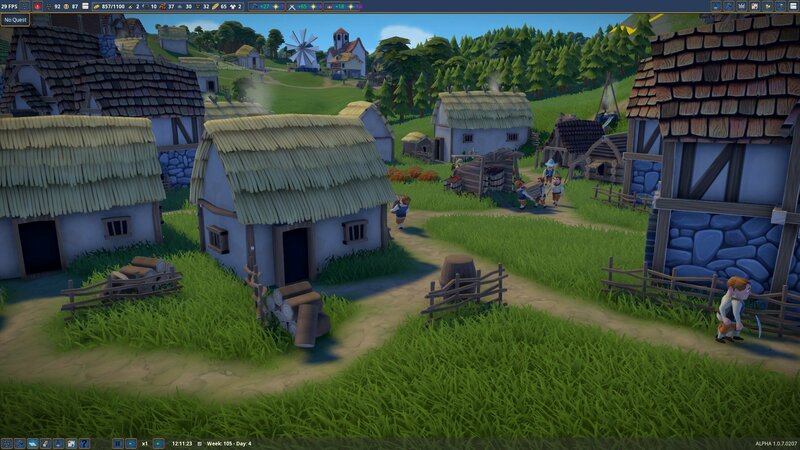 Unlocking these buildings is done by having enough of two kinds of special resources and a minimum amount of villagers with a specific social status. The religious buildings, for example, require splendor and influence with the clergy. You get these by building religious buildings (or expanding existing ones) and by fulfilling some requests for food resources. 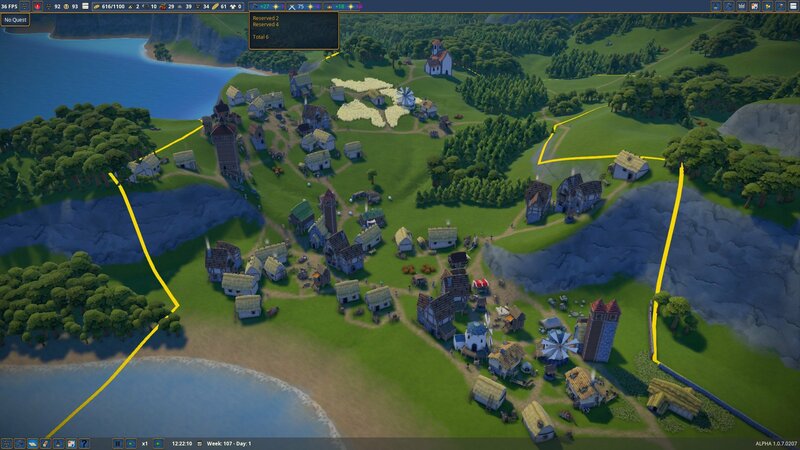 For the last unlock, the monastery and its expansions, you need 10 citizens and 50 splendor. Some buildings let you build certain expansions or extra that make your building look different from another player’s. My manor has the core part, a door on one side, a tower that is only slightly taller than the core and three small treasuries on the side. The game has a very basic trade function. You build warehouses and each one can hold up to four different resources/materials. Then you unlock the three available trading routes. The first one is easy to get. I forgot what it needs, but it was something you have very fast. I think it was either wood or berries? The third trade route asks for 1000 gold. As you can only have a maximum of 500 at first, you will need to build your manor with expansions to bring the cap up to at least 1000. Then you can choose which resources to sell or buy and how many you want to have in stock – so you don’t sell all your food at once leaving your villagers to starve or you buy so many tools that you go bankrupt (I’m actually not sure if you can go bankrupt… your budget can be negative, but I have not gotten a “game over” window so far when it was). For your villagers, you will build little markets where you place some villagers to sell certain kinds of food (depends on which food you choose) or goods like clothing. Each kind of ware will need one stall. So, for fish and berries to be sold, you will have to build two different market stalls and each one will need one market tender. I also have a keep with soldiers and they are sometimes sent away and come back with the aforementioned resources and the free zone expansion. But I can’t upgrade the soldiers, equip them with anything or see them fight. I can also build walls around my village, but I haven’t gotten attacked yet. I assumed that it would be part of the game at some point, because otherwise, why put in walls in the first place – but I did find a thread on the Steam forums suggesting that no combat will be in this game, so the walls are probably just for looks. 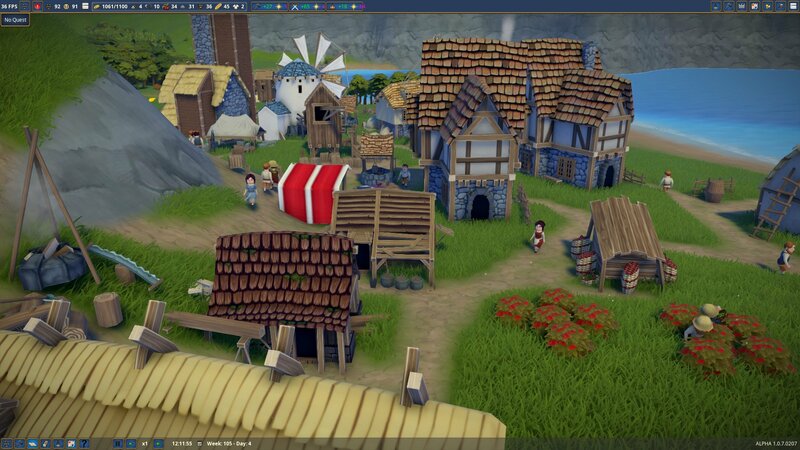 I haven’t built any walls yet, because I keep expanding the village and it’d be nonsense to do that. In no time, half of my village would be outside the village walls! The user interface is pretty neat. It lets you open windows and freely drag them on the screen to where you want them. Keep as many or as few open as you like to get all the necessary information. I would like to have the option to resize the windows, because I sometimes need only one piece of information on there and not everything. Villagers have names, but only to a certain amount. I currently have Robin, Victoria, Male#523 or Female#636. The latter two came to my village recently. Unfortunately, I cannot rename them, so I am stuck with the generic numbered names. They also level up in their professions, but nothing above “level 1” is available yet and I don’t know if or what the impact of a level 1 is. The graphics are okay. I like the less realistic graphics, actually. 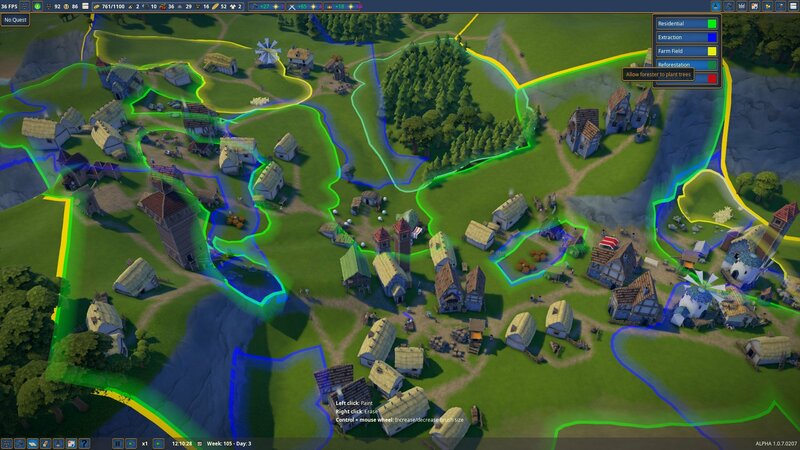 It makes it look more fun than, for example, Banished. The villagers’ eyes are a little bit creepy, though. The sheep are funny little cotton balls, but they don’t have animated feet. They’re basically just “floating” on the ground. Still, when the sheep are moving in grass, you can’t see this and it doesn’t bother me. If you want to see what else will be added to the game, the developers have a roadmap. 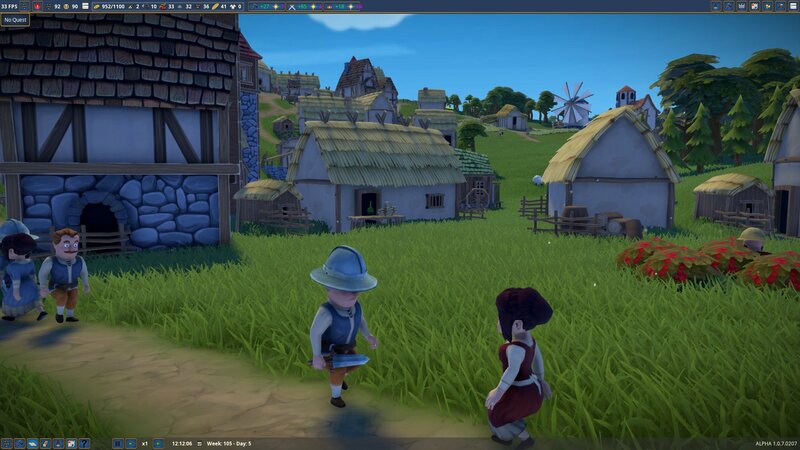 It also lists character design and “environment rehaul”, so I only covered the graphics very briefly as they could still change (I’m mostly hoping for a fix for the eyes, though, and maybe some walking sheep. Everything else is fine and pretty! ).